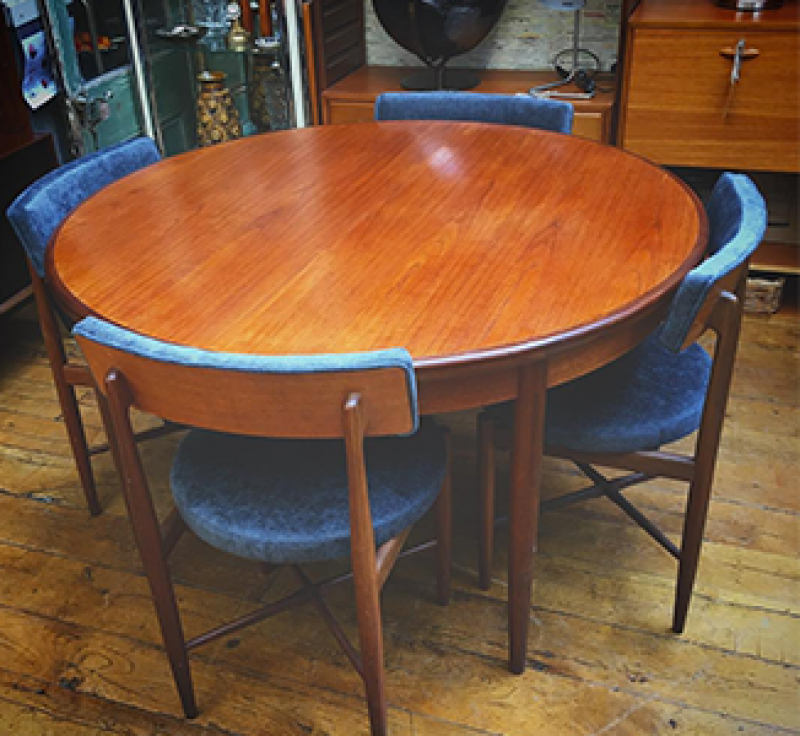 This G Plan Fresco dining suite was in a rather sorry state after 50 years of use and cleaning with harsh chemicals. It's great to be able to get the satisfaction of bringing such a handsome piece back to life so that it can live on to give another family years of use & memories. The table has been knocked apart and re-glued on all loose joints so as to strengthen the frame. Now that the base and structure of the table is sound it's time to start on the top. Firstly all the old polish is stripped back with chemical stripper and scraped by hand to provide a clean fine base before being hand French polished in our workshops. shellac-based finishes, not all of which class as French polishing. French polishing is extremely labour intensive and takes many days (sometimes weeks) to achieve a satisfactory finish. It consists of applying many thin coats of shellac dissolved in alcohol using a rubbing pad, lubricated with oil. The rubbing pad is made up of absorbent cotton or wool cloth wadding inside a square piece of fabric (usually soft cotton cloth) and is commonly referred to as a fad or rubber. It is considered to be one of the most beautiful ways to finish highly figured wood, but it is also recognised to be less durable than some other finishes. It is softer than modern varnishes and lacquers and is quite sensitive to spills of water or alcohol, which often produce white cloudy marks. However, it is more forgiving to work with and worn polish may sometimes be cleaned and improved, rather than stripped - which most modern finishes require if aged or damaged. After letting the polish harden, which takes a few days, the whole is then inspected again closely by eye and hand, sometimes the only way to find imperfections is by touch. Once the restorer is happy the finishing touch is a mixture of wax and cutting back with fine wire wool, before a final application of top wax and a good hard buff, again by hand, to give the final perfect finish. Next on to the chairs. The chairs are made of teak and have upholstered seat and back rests. The chair legs are turned and tapered and curve into the join with the back rest, also curved. Cross brace stretchers between the legs ensure sturdiness in the chairs. Shaped and curved wood features are a sign of good quality furniture; it takes more time and timber to produce furniture in this way. The upholstery pads and backs are removed, refinished and the n sent to the upholstery workshops for complete overhaul. All of the old fabric and foam is stripped off and thrown away, new foam interiors and seat pads are shaped and cut, in modern hi-resilience and more importantly fire- safe foam. 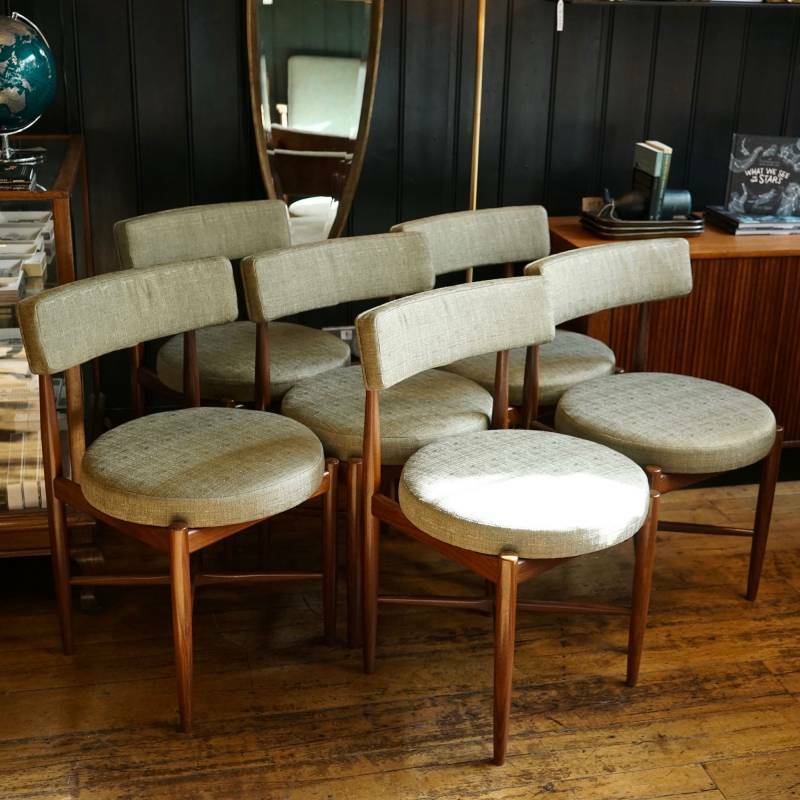 The fabric upholstery is measured a template made before being cut, sewn & finished with piping detail, just as they originally were over 50 years in the G Plan workshops. Meanwhile the chair frames are knocked apart, joints cleaned and re-glued, to provide a stiff solid 'as new' frame. The old polish finish is stripped back, hand finished to clean substrate and polished by hand in our workshop. After re-uniting frames with the newly upholstered seat and back pads, the same finishing touch as the table is applied. A mixture of wax and cutting back with fine wire wool, before a final application of top wax and a good hard buff, again by hand, to give the final perfect finish. At last, 3 weeks after starting a handsome Fresco dining suite I ready for a new home. Launched in 1966, Fresco remained G Plan's main range of furniture throughout the 1970s. Manufacturer: G Plan cabinet furniture in High Wycombe England. Materials: Teak & Afromosia solid wood and veneer. Origin: 1968 - 1970s, Made in the UK.